The Hubble Space Telescope has proven itself to be one of the most invaluable pieces of equipment in modern astronomy. For all the talk of the other equipment in the science arsenal, the Hubble is a major piece of equipment. The Hubble Space Telescope has already captured the oldest object in the universe, now it’s also going deeper than any equipment can, thanks to the Hubble Ultra Deep Field. 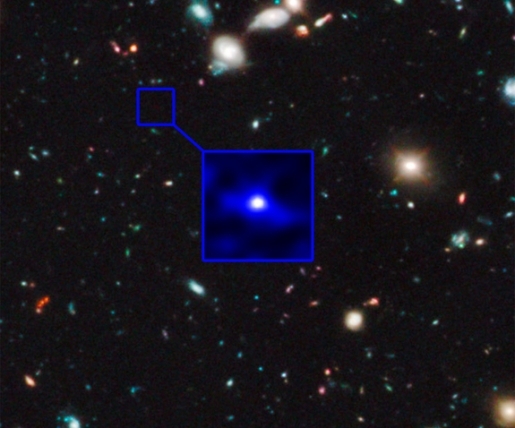 Using the Hubble Telescope’s Wide Field Camera 3, a team of astronomers has discovered the most distant galaxy in the universe visible from earth. Astronomers have also recently completed the largest image of the night sky ever captured from Earth using the Sloan Digital Sky Survey. The galaxy in question, UDFj-39546284, has a redshift of 10.3. Redshift is a term that measures how the expansion of space has stretched the wavelength of an object’s light into the redder, longer spectrum. A redshift of 10.3 means that UDFj-39546284 is a staggering 13.2 billion light years away from Earth. No spring chicken by galactic standards, UDFj-39546284 formed 480 million years after The Big Bang.